The Himalayan Honey Bee, which is twice the size of normal honey bees. The honey from these bees is known to have hallucinogenic properties and tribes in Nepal collect this honey from high cliffs. 2. Cockroaches are so repulsed by humans that if they're touched by a human, not only do they run away, but they wash themselves. 3. When a Bombardier beetle is threatened, it releases dangerous boiling chemicals at it predators. It achieves this by internally mixing 2 chemicals. The beetles' glands store enough hydroquinone and hydrogen peroxide to allow the beetle to release its chemical spray roughly 20 times. 4. The Asian Giant Hornets that can get to the size of a human thumb stings with flesh-dissolving acid, which alerts other wasps to sting you until you die. The Megaphragma mymaripenne wasps are smaller than amoebas. At just 200 micrometers in length, they have a functional brain and are capable of vision, flight, searching for food and places to lay eggs. 7. Some older/less efficient worker termites will develop 'backpacks' of toxic chemicals that explode when the termite is threatened. They are essentially used as suicide bombers when the colony is being attacked. 8. Dragonflies have a high power/weight ratio and have been documented accelerating at 4G linearly and 9G in sharp turns while pursuing prey. 9. The Emerald cockroach wasp injects venom into a specific part of a cockroach's brain to stop its escape/survival instinct response, lays an egg in its abdomen, then its larva eats the organs in a specific way to keep the roach alive before it cocoons and leaves its body. 10. 'Velvet Ants' are actually wingless wasps. In 1312, a few Cockchafer Beetles, which were a major pest for crop farmers, was brought into a courtroom in Avignon and ordered to withdraw to a designated territory. When the beetles (obviously) didn't comply, they were collected and killed. 12. Bees don't generally die when they sting. They die when they sting humans or other animals with similarly thick skin but can sting other insects just fine. 13. Butterflies remember their days as a caterpillar. Despite going into a completely liquified state during metamorphosis, the neurons for their brain stay arranged as such to allow for the memories to stay intact. 14. A single ant can live up to the age of 29. 15. Mosquito are actually very weak fliers, reaching only a speed of 1 mph. The American Mosquito Control Association says just a fan can keep them away. A species of tiger moth named Bertholdia trigona effectively jams bats' echolocation by producing up to 4,500 clicks per second. This jamming is the most effective prey defense against bats ever documented, reducing their success rate tenfold. 17. Dragonflies are one of the most efficient killers in nature, capturing their prey more than 95% of the time. 18. Male bed bugs inject their sperm into the female (and male) by puncturing the body wall as the female has no natural opening for reception of his sperm. 19. Tarantula hawk wasp’s sting is so painful (yet non-deadly) that experienced professionals will suggest you to just lie down and scream if stung because most people lose verbal and physical coordination afterward. 20. There is a species of ant (Solenopsis daguerrei) that will infiltrate a fire ant colony, kill the queen, then take her place. The workers raise the impostor's children, which then fly off to infest more colonies. These ants are being considered for viable biological deterrent to control the spread of fire ants. Charcoal beetles fly into still-burning forest fires to mate and lay eggs because competition and predators will be low. They sense distant fires using infrared armpit sensors. 22. 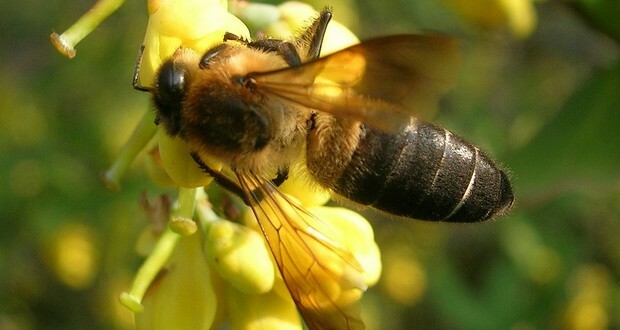 Africanized bee, which are also known as killer bees, are breed hybrids that accidentally escaped lab quarantine and since have spread throughout the Americas. 23. In the Amazon, butterflies will drink the tears of turtles to provide necessary sodium in their diet. 24. Ants cannot be seriously injured from impact with the ground after being dropped from any height, because they don't have enough mass. There is no next or previous page buttons at the end of any of the articles. OMG! Thank you for pointing it out. Last night, I added some feature and it messed up the page links. I wonder why someone didn’t point it out earlier.